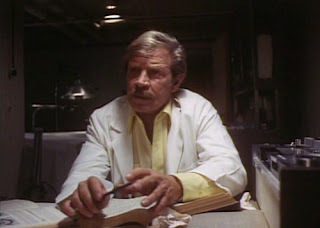 Dr. Leonard Chaney (Richard Basehart) is a brilliant and rich eye-surgeon. One day a dog crosses in front of his car, as he is driving. His pretty daughter, Nancy (Trish Stewart) warns him, and he swerves the car to avoid hitting the pooch but crashes. The broken glass from the front window causes his daughter to go blind. So, while he may care about doggies (Yay!! ), he is not necessarily a very good driver (oh well, no one is perfect!). He begins to transplant the eyes of living people into his daughter's eye sockets. She can see, but the effect doesn't last long. So, he keeps on collecting eyes for his daughter, with the help of his loyal housekeeper Katherine (Gloria Grahame). 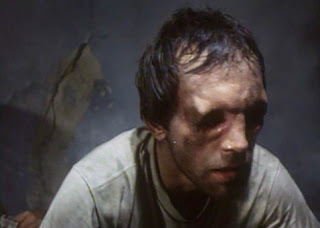 All the while, keeping his victims (including among them modern day horror legend Lance Henrikson as Nancy's fiance), all sans eyeballs, locked in a cell in the basement. Mansion of the Doomed is actually the first movie that B-movie mogul and legend Charles Band produced. It's also the directorial debut of actor Michael Pataki (best known for acting gigs in movies like Halloween 4 and Rocky IV). He only directed two more times, and well, it's quite honestly better that he stuck to acting. Still, despite being a pretty derivative flick of Eyes without a Face, it still manages to be pretty entertaining, despite it's flaws. Patakis isn't particularly good at building tension or suspense, and, for the most part the movie is kinda just there. Thankfully, it is pretty short and goes by fairly quickly. It's enough to keep you interested in what is going on, and what to know how it's all gonna end. It's really aided by a cast that is way better than this movie probably deserves. Richard Basehart is really credible as the sort of sympathetic villain. He gives his all and helps to hold the movie together. Also, quite good is Gloria Grahame as the housekeeper who loves him and is will to do anything to help him and his daughter. They both add some class to the whole proceedings. Henriksen, one of my all time favorite actors, is quite young in what is one of his earliest roles. It's a cool one for us fans of his to see. He definitely has always had good acting chops, even while missing his eyes! Speaking of eyes, there is lots clinical level grue with all the graphic eye surgery. It was enough to garner the attention of the British authorities during the whole Video Nasty era. While, it never made the official list, it was in the third section, which meant it could be seized. It's on the excellent second volume of the documentary, Video Nasties: The Definitive Guide Vol. 2, that I first heard about this one. 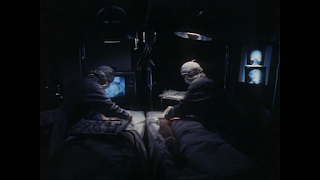 The FX handled by a young Stan Winston (making this the second Terminator/ Aliens connection!) are excellent and gruesome. Full Moon currently has a DVD of it out. It is full screen and has not been remastered, so it looks pretty grainy and crappy. The Mono sound is just OK. It sounds clear and there isn't any hiss or other major issues, that I noticed. 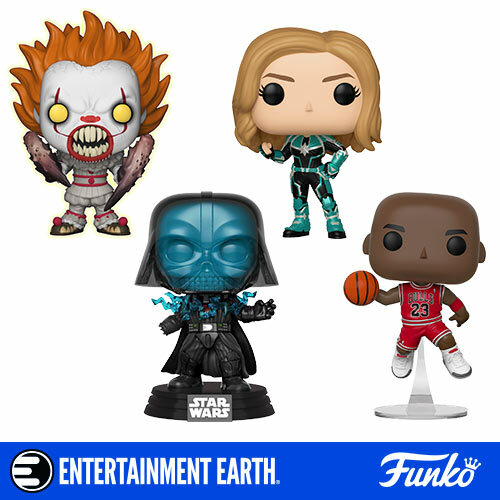 It also comes with trailers to other exploitation films that Full Moon sells. Yet, oddly this movie's trailer ain't here. Huh? Still, the DVD can be found pretty cheap, and is worth looking for, at the right price. 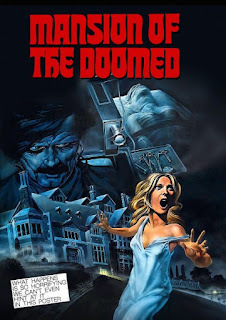 Mansion of the Doomed is a little on the pedestrian side, at times. But, it's made watchable thanks to some solid acting and good gore. Coupled with a short running time and a suitably nasty ending, it turns out to be an overall decent little movie. So long as they don't expect a masterpiece or anything original (or a quality DVD), fans of gore, mad doctors, 70s cheapo horror, and/ or Lance Henriksen will be in for a little bit of a treat.